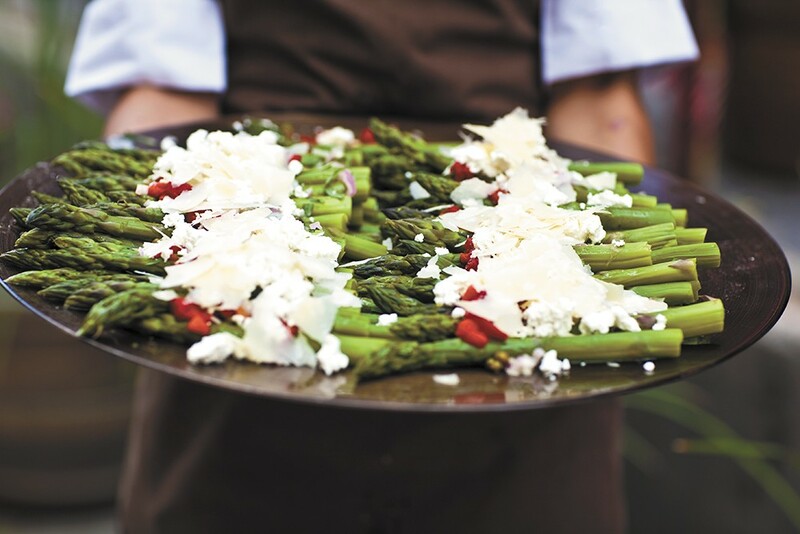 Try this: asparagus salad with roasted red peppers and goat cheese. It was 1997, the first time the waterfalls were turned on in front of Beacon Hill's clubhouse, on the lawn among the gardens and bridges, overlooking Spokane and its abundance of trees. It was the wedding day of Ellie Aaro's sister and the first wedding ever held at Beacon Hill. Aaro owns Beacon Hill Events with her father Pete Rayner, who built the elegant hilltop facility. Back when her sister got married, Beacon Hill was just an event center, but Aaro felt something missing. Caterers constantly bustled in and out of their clubhouse, but she says she got the sense Beacon Hill would only ever be as good (or as bad) as those caterers. "Food is just such a component of an event, and I've always loved to cook and entertain," Aaro says. So they created Beacon Hill Catering in 2003. Aaro attended culinary school at Le Cordon Bleu in Paris, returned and worked for a while as the executive chef. Beacon Hill Catering does full-service catering and event design for more than 400 on- and off-site events a year. Current executive chef Ryan Jordan and his team cook up Northwest-fresh-style food, drawing menu and presentation ideas from frequent travels to San Francisco, Napa, Los Angeles, Seattle, New York, France and Italy, says Aaro. "There's a rustic elegance to the way we serve food," she says. "We make sure everything is aesthetically interesting and beautiful and still approachable." One of their signature dishes, phyllo-wrapped herb chicken breast with champagne-shallot sauce, won them "Best Entrée" at a past Epicurean Delight. They're also known for their signature Beacon Hill Brownies, says Aaro. "We are always finding a way to make food memorable." she says. Beacon Hill has its own taste, flair and vision, but Aaro says its mission is to focus on the client and make sure the event has a personalized style. "We're really just people pleasers," she says. "That's our ultimate goal — just to make people happy. We're perfectionists around here, too. We never let anybody down." Whether it's a wedding, corporate event, retreat or someone's birthday party, Aaro says they're lucky to be involved in such major celebrations. "We're fortunate that we get to be part of the bright spots in people's lives," she says.